Are Sesame Seeds Good Sources of Protein? The tiny sesame seeds that you find on rolls, cookies and broccoli stir-fry originated in Africa, according to Chow.com. They have now traveled throughout the world, adding texture, nutrition and flavor to a variety of dishes. You have a choice of three colors, white, tan and black. Each has the same nutritional profile, but a slightly different taste. Toast your sesame seeds to intensify their flavor. Your daily requirements for protein intake depend on your age and weight. Protein intake should be between 0.8 to 1 g for every kilogram of body weight. Harvard University states that this translates to approximately 64 g of protein for a 160-lb. adult. The U.S. Food and Drug Administration ranks food sources that provide 5 percent or less per serving of the daily value in a 2,000-calorie diet as low nutrient content sources. Those that have 10 percent of the recommended allowance are good sources. Foods that have 20 percent or more of the nutrient are nutrient dense or high content sources. Sesame seeds are almost 50 percent oil by weight. Like other nuts and seeds, the recommended serving size is 1 to 2 tbsp. due to the high fat and calorie content. In order for sesame seeds to be a good source of protein, they need to provide a minimum of 6.4 g per serving. A tbsp. of sesame seeds has 52 calories, with 1.6 g of protein. This serving weighs 9 g, of which 4.47 g is fat. The saturated fat content is 0.62 g. It provides 1.1 g of fiber and 2.1 g of carbohydrates. 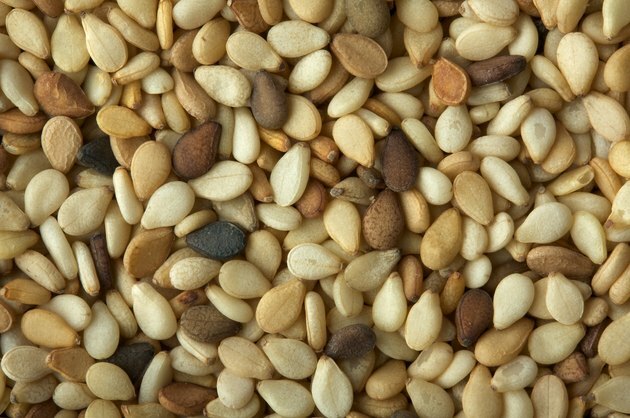 Sesame seeds contain calcium, iron, magnesium, phosphorus and potassium in amounts below 10 percent of the daily value. A serving of sesame seeds has less than 10 percent of the daily protein requirement for the average 2,000-calorie diet. The nutrient profile for these seeds makes them a good supplement to other plant proteins in vegetarian and vegan diets. Alone, the amount that you would have to consume to reach 10 percent of your daily would result in a high calorie intake.